Django’s story of revenge, romance and redemption. an Alliance Films release. Credit: Andrew Cooper. In 1858, two years before the American Civil War, in the deep South, Django (Jamie Foxx) is a chained slave being dragged through the forest. But appearing in the night air is Dr. King Schultz (Christoph Waltz), a German dentist-turned-bounty hunter (there’s more money in the latter trade), and he wants to buy Django. Specifically Django, and he won’t take no for an answer. Schultz is the typical Tarantino protagonist; he has an advanced vocabulary and a quick wit and an even quicker draw of the gun. Waltz is the perfect Tarantino actor, delivering the lines with grace, humour and speed and getting the audience on his side so we can continue with this story of murder, slavery and revenge. 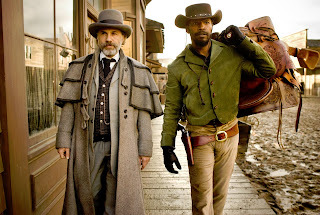 DJANGO UNCHAINED, an Alliance Films release. Schultz does not believe in the owning of other human beings, but he does need Django’s help so he cuts him a deal. He’ll unchain Django and if Django helps him find a particular bounty, then Schultz will help him find his wife, a fellow slave. And thus begins Django’s story: the journey of chained Django to unchained Django. And yes that does take nearly three hours, but it’s a purely, naturally progressive character study (with Tarantino’s typical forays into violence and racism). Django is smart enough to recognize that he can learn a lot from Dr. King Schultz; he does have a way with words after all. Django and Schultz’s friendship takes us through conservative western towns, desert landscapes, and winter mountain tops, all realized with beautiful, illustrative scenery and perfectly constructed production designs. Django’s wife, Broomhilda von Schaft (Kerry Washington), is owned by rich plantation proprietor Calvin J. Candie (Leonardo DiCaprio). Monsieur Candie is like a baby with money. He’s a rich, immature, petulant child but one who has control of everything. He’s a Francophile, but don’t speak French to him; he doesn’t understand it so he’ll just get mad. Once we arrive at Candyland (yes, that is exactly what Calvin Candie named his mansion and plantation), the film pushes forward with full force into the heart of racism. Candie gives a deeply troubling and powerful monologue about his take on the difference of races. Even more troubling is Candie’s senior house slave and trusted advisor, Stephen (Samuel L. Jackson). Stephen is black himself, but he feels so powerful in his role as Candie’s closest confidant, that he perpetuates his master’s harsh treatment of slaves. 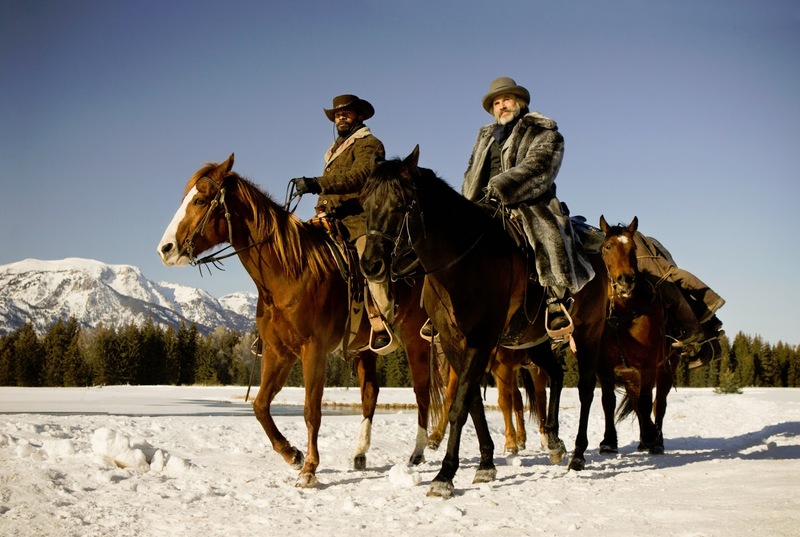 The film becomes increasingly violent at Candyland, but once we leave Candyland, the script takes a turn for the brilliant and shows us the complete character arc for Django. 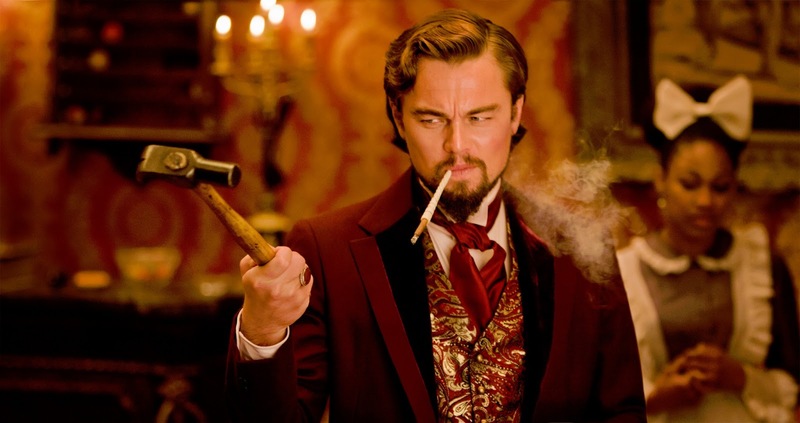 “Django Unchained” is Django’s story of revenge, romance and redemption.